Thanks to positive moves by mobile manufacturers, financial institutions, and mobile app development companies, the world of mobile payments has been rapidly evolving. Today, many retailers and stores have started accepting payments through the mobile, and mobile based payments in the USA alone are expected to touch $142 billion by 2019. Every day, new brands and retailers announce their support for some of the more prevalent mobile payment solutions, including Android Pay, Apply Pay, etc. The most widely used models for mobile payments include premium SMS, direct mobile billing, mobile web-based payment, and contactless NFC. In this type of mobile payment model, a consumer sends an SMS text message to initiate the payment process and a premium charge may be applied on the consumer's mobile bill or an online wallet. The merchant who receives the order request can then arrange for the delivery of the purchased items. Although heavily used previously, and receiving extensive support from giants such as eBay, this form of mobile payment is steadily on the decline now. When a consumer uses a direct mobile billing option during a purchase at any website, the amount of the purchase is directly added to the mobile bill of the customer. This method is very popular as it bypasses the internet banking or from using your credit/debit card. It is widely supported by the Google Play Store as well as the Windows Store, amongst others. In this method of mobile payment, the consumer uses the internet or web pages or through any dedicated application installed on the phone to make their payments. The underlying technology used for such payments is Wireless Application Protocol (WAP). This method is now being incorporated by many mobile network operators. NFC is a rapidly growing method of mobile payment which aims to revolutionize the way consumers interact with their devices to make payments. A consumer uses his NFC enabled mobile phone to tap at the merchant's receiver module and the payment is initiated. "Touch to pay" is quite popular in many countries already. 2018 will see a massive rise of this method of contactless payment due to the availability of the required infrastructure. 1. Counter Checkout Will Slowly Become Obsolete: With an increasingly large number of people opting for payments through mobile, the process of counter checkout is slowly becoming obsolete. Standing in a queue to pay for what you buy at a store will be a thing of the past, as with contactless payment options, people can get out of the queue faster, and in some cases, never have to get in a queue. 2. Deals and Offers will Increase: With an increase in mobile payment options, businesses will float in more deals and offers so as to attract existing and new customers. The convenience provided by mobile payments will encourage consumers to come back for more as well, thereby leading to better business revenues and enhanced customer satisfaction. 3. Newer Technology Upgrades: People are increasingly using mobile for making payments. This trend in the market will force all retailers to upgrade their technologies from swipe-and-sign cards to chip-and-pin card systems with adequate provisions for NFC. These upgrades will in turn encourage more people to use their mobiles for payment. 4. NFC-based Payment Will Gain Momentum: More and more phones being released these days come embedded with the NFC (Near Field Communication) technology. This method of just tapping your phone to a reader module will process the payment transaction in a streamlined and hassle free manner. Both Apple Pay and Android Pay support NFC, as a result of which this segment of contactless payment will see massive traction in the coming years. 5. Personalized Shopping Experience: With the amount of data being collected by your mobile phone and particularly the mobile payment apps, a consumer will get to experience personalized shopping experiences, whereas businesses will benefit from better targeted marketing. Creating consumer interest by personalizing their shopping experiences will also ensure better business revenues. 6. Loyalty Programs will flourish: A lot of different loyalty programs by various firms will spring up with an increase in mobile payments. Providing incentives to customers has always been a great way to attract more people and build up a cult following. Incentives and discounts provided by loyalty programs will further encourage consumers to come back for more. 7. 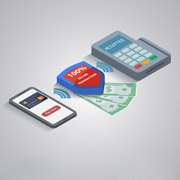 Increased Security and Trust: As mobile payments are evolving, firms are working towards increasing the layers of security in mobile payment apps and wallets. People usually store their card and internet banking details in various mobile payment apps and mobile wallets. 2018 will see firms investing more time in improving the security of their payment apps which in turn will help in boosting customer trust. One of the best advantages of mobile payments is how easy it is to integrate all incentives and loyalty programs. This allows the user to keep track of the numerous loyalty programs at just on place. The consumer does not have to worry about the different points or credits they have earned through their purchases as well, ensuring their shopping experiences are enhanced over time. In this fast moving world customers hate to wait. Mobile payment has revolutionized traditional payment methods by increasing the speed of transactions. So much so, that with mobile payments, it is very easy now to pay-and-go than ever before. Payment is the least enjoyable part of the shopping experience, and people do not prefer to wait in queue to do it. Mobile payments therefore help to successfully rectify this issue. The mobile payment method is one of the easiest methods of making payments. Mobile payment gives the liberty to the consumers to do the payment from anywhere and at any time. It allows the customer to buy products or avail to services without having to physically count and handover cash or swipe their card. By using mobile payments, consumers do not have to worry about the security risks involved with carrying a lot of cash or their credit cards. Moreover, the credit card information is not stored on your phone, but in the cloud thus making mobile payment a very secure method to pay. Today, with the proliferation of fingerprint sensors in the latest phones, an added layer of security has been added to the payment apps as well, as people can log in easily with a single finger swipe. Be a Part of the Mobile Payment Revolution with Outsource2india! Outsource2india has been providing mobile payment solutions to businesses for a long time now. We have been in the mobile app development business for more than a decade. Our team of excellent mobile app developers has plenty of experience and will understand every business' mobile payment solution requirement. If you are looking for a mobile payment solution, feel free to talk to our representatives or fill our inquiry form, and we will get back to you within 24 hours.